Most, if not all, programming languages allow you to create subroutines, functions, or methods, all of which follow the same principle. You can think of them as black-boxes that contain source code to perform a specific task. For example, you could create a function make_coffee() which contains source code that makes coffee. Whenever you feel in need of a steaming hot cup of coffee in your program, you just need to invoke the function. Now, imagine you were a tiny little person locked up inside this black-box and your job was to make that coffee. Imagine you standing at a Starbucks counter, some customer walks up and says: make_coffee(). What would your immediate reaction be? Would you inquire for more specific details on that order, such as “Tall? Grande? Venti?”, “For here or to go?” and so on? It is easy to see that a simple command such as make_coffee() is not sufficient for you to start brewing coffee (… apart from the fact that your client must have learned manners by speed-reading 🙂 ). The pieces of information you pass to a function at the very moment of its invocation are called parameters. A function may have zero, one, or many parameters of any data type. I have been using three parameters of String (or char* for C-Programmers) in this example. 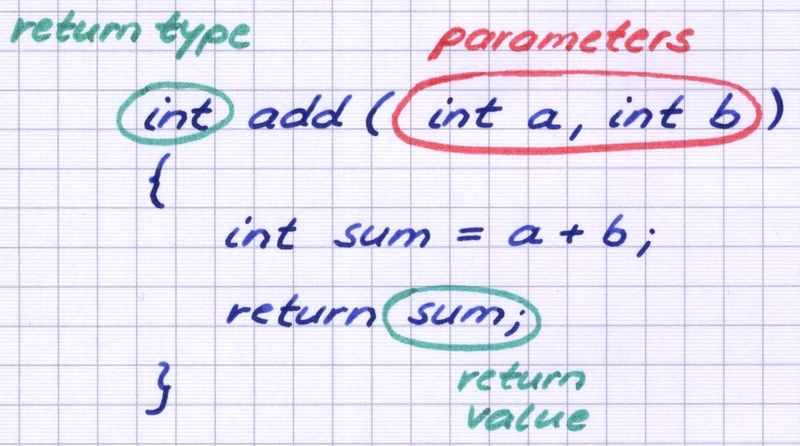 Let us now take a look at how functions can return a result. As stated above, the function make_coffee(…) will eventually deliver a hot cup of coffee. Any invocation of make_coffee(…) is going to directly represent the function’s return value at runtime. Thus, a function can return only one single result value upon each invocation. If you want a function to return more than one value, e.g. multiple cups of coffee, at a time, you’ll have to make the return type a container that may contain than one item. The way how functions are defined and invoked basically looks similar in most programming languages. The following example shows how we define a function in C.
This function is capable of adding two integer values (a and b). It returns the result value directly. We can now use (invoke) this function within other functions, whenever we need to add two values. Note that the function invocation add( 5, 3 ) directly represents the corresponding return value. This allows us to assign it to an arbitrary variable for further use, e.g. output. You may also invoke functions within larger formulae. Always keep in mind that the invocation of a function represents its return result. If you want to impress your friends, you can even invoke functions where you pass parameters to functions. This example calculates 3 + 5 + 2 + 7. Be aware, however, that code like this may significantly decrease both readability and maintainability of your source code. This entry was posted in Programming Essentials, Uncategorized and tagged c, function, method, parameter, return value, source code, subroutine, variable. Bookmark the permalink.